It’s easy to dismiss affirmations as a new-age fad – a pointless habit practised by gullible people. But in fact, used properly they can be incredibly powerful, and even help you to achieve the career or business success you desire. Over the past few years, it’s unlikely that you have missed the growing popularity of affirmations. They’re everywhere – on websites, in books, framed beautifully as pictures, and even plastered on mugs and coasters. But what exactly are affirmations, and why are they so ubiquitous? Affirmations are the practice of positive thinking and self-empowerment, and usually take the form of short statements or conscious thoughts (set in the present tense) that we repeat to ourselves to help us re-shape or create our reality. Cynics may write off affirmations as wishful thinking – trite, meaningless thoughts that we parrot foolishly to ourselves instead of making real, proper plans for actual action. But in fact, affirmations DO have a place in the work that you’re doing to create the career or business you want – and used properly, they’ll even help you to get where you want to go faster and more confidently. And far from being a modern invention or fad, they’ve actually been around for decades, and were originally conceived by a medical professional. The father of affirmations is considered by many to be the French psychologist and pharmacist Emile Coue. In the early 20th century, Coue noticed that when he told his patients how effective a potion was as he gave it to them, the results were much better than if he said nothing. He realised that ideas that occupy our minds exclusively become reality, and developed a form of autosuggestion, asking his patients to repeat the words, ‘Every day, in every way, I am getting better and better’ to themselves every day. Over the course of his life’s work, Coue achieved many remarkable cures with his techniques – but he also failed. You see Coue discovered that his methods didn’t work if his patients made an independent judgement about their affirmation, and he concluded that you really needed to believe what you were saying for it to come true. And that’s the stumbling block when it comes to affirmations. It’s all very well telling yourself ‘I have an amazing post-baby career’, but if deep down you don’t really believe it, if your heart honestly knows that you’re actually struggling to even work out what you want to do, much less throw what little energy you have left after looking after your children into it, it’s not going to work. Because while you can repeat your chosen mantra every day religiously, you can’t fool yourself – and you really, really need to believe in the certainty of your affirmed state for it to come about. And yet, all too often that’s exactly what we do with affirmations. We think they need to be really ‘out there’ and ambitious, or else what’s the point? We either dream big or don’t bother. We also look to others to suggest some ‘ready-to-wear’ statements that we can adopt, without really sense-checking whether they feel right for us. Which often leaves us reciting a grand, vague mantra that’s completely at odds with how we’re feeling now. ‘I’m supermodel thin and toned’ won’t work when the mirror tells you that you’re still carrying your baby weight and you haven’t been to the gym for years. ‘I’m running a successful multinational business’ isn’t going to convince your subconscious when your main occupation in the working week is watching daytime TV. ‘I am wealthy beyond my wildest dreams’ probably won’t ring true if you’re struggling to pay your household bills and haven’t been able to afford any new clothes in months. The danger in choosing an affirmation that is so incongruous with how you feel right now, is that it can actually paralyse you into doing the opposite of what you intended. And instead of feeling more empowered and taking positive action towards your desired state, you instead give up, feeling as if what you want to be is SO far off where you are that you’ll never get there. So what’s the point in trying? So what do you do? Give up on affirmations as a waste of time? Actually, no. Used properly affirmations can be incredibly powerful and genuinely help you to achieve the results you want. The trick is to find the right affirmation for you, at this point in your life. So how do you choose an affirmation that will work? In many ways, it’s not unlike pinning down a SMART goal. The first thing is not to be too vague or all-encompassing. A broad, ‘I have an amazing career’ doesn’t give your subconscious much to grab onto. It also sounds too fantastic to generate real, deep-down conviction, and doesn’t help you recognise when you have reached your desired destination (another vital element of a SMART goal). I enjoy and am appreciated for the work that I do. I am on a journey to owning my own business. I respond to stressful situations with calm and wisdom. I am relaxed and confident in my job interview. I am convincing and successful in my business pitch. All these affirmations are possibly a step up from what you are feeling or experiencing now. They describe a desired state, but not one that is unreachable. They also enable you to take realistic and appropriate action to achieve them. And once you have achieved them, you can create a new affirmation for the next step on your journey, tweaking your inner mantras to match your progress. In a way, think of this approach as like chunking big goals into achievable steps – the same theory applies. If you have a massive, super-ambitious affirmation, it’s hard to believe to your very core that you WILL get there (and that is exactly what you need to do for affirmations to really be powerful). And it’s just as tricky to understand exactly what you need to do first to start making the change. Hypnotherapy and Neuro Linguistic Programming (NLP) also make good use of the power that continuous positive thought can wield. NLP founders John Grinder and Richard Bandler discovered that by increasing positive behaviours and eliminating negative ones, we were more likely to achieve success. Taking this one step further, they looked at language patterns that unintentionally limit our understanding and potential. And hypnotherapy also uses the incredible force of language and deeply-held beliefs to enable people to make almost-miraculous changes in their lives. For example, when helping a hypnotherapy client alter an unhelpful mindset or habit, you would repeat several times over the desired situation or habit to them while they’re in a state of relaxation. And often this produces surprisingly fast and long-lasting results. But as with good affirmations, the state or new habits you are ingraining, and the language you use, is tailored exactly to each client and their unique situation – and is realistic and achievable. So what’s the conclusion? 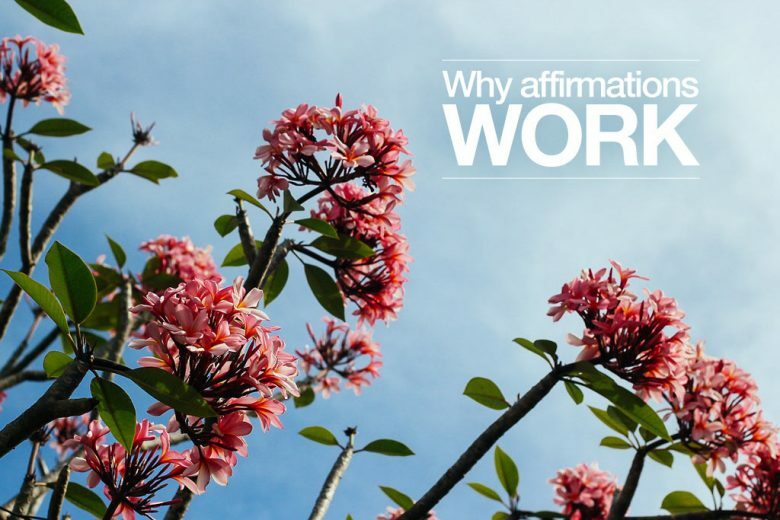 We believe that affirmations can, and do, work. But we’d be wary of taking a one-size-fits-all-approach. By all means browse the many websites offering positive affirmation suggestions, but only adopt those that genuinely fit your situation – and that you honestly believe. If you can, write your own affirmations, or tweak mantras that others find helpful – and enjoy discovering just how powerful a new, positive inner voice can be in helping you take big steps towards the career, freelance work or business you want.